The date of my last post was March 28, whaooo! that was just much too long and many waters have passed under the bridge over this time. I left my place of residence, Abuja on March 29 to travel to Lagos to sit for an examination which was expected to start on March 31 and last for a week and then start some work on my functions in my office like going to offices to introduce the organisation and delivering our letters of introduction. The funny thing about the exam I was going to write was that I did not have the materials I needed to study for the exam. So on getting to Lagos, the first thing I did was to go to the school where the courses are taught to pick up my materials. I was on my way going when someone accosted me and asked if I knew the exams had been postponed till the next week? I was............ lost for words........, I didn't know what to say, I just muttered I think some curses to the school under my breadth for doing such a thing and without any notice to the students which was a sign of No Respect at all!! I don't know if this happens to all people that commit themselves to being students just in order to acquire some more knowledge than the basics you get from a first degree. I commit my self to knowledge and I am being made vulnerable to all administration of the institution and even to some riff-raffs that take too much pride and flex too many muscles just because they are (un)fortunate to be employees of the institution. Anyways, I have had to read, and read and read and sleep only a little and even then with my head spinning around what I have read and that gave me NO time to post anything on this blog. 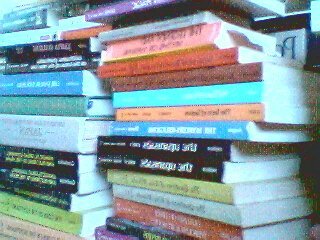 If I had wanted to, I needed to go to a cybercafe which is a 5mins walk away from my house, that meant 10mins of walking and one hour of browsing totalling one hour 10mins of reading time which I could not afford to spare. Well, I will still keep to my promise of not abandoning this blog. Dear blog, I stick with you!!!! well done, we found you and will stick with you.